As I was driving in to work recently I was following a pickup truck whose tailgate was filled with what I call, “bumper sticker commentary”(BSC). The owner was clearly trying to be provocative by the extreme messages that were communicated on her tailgate. 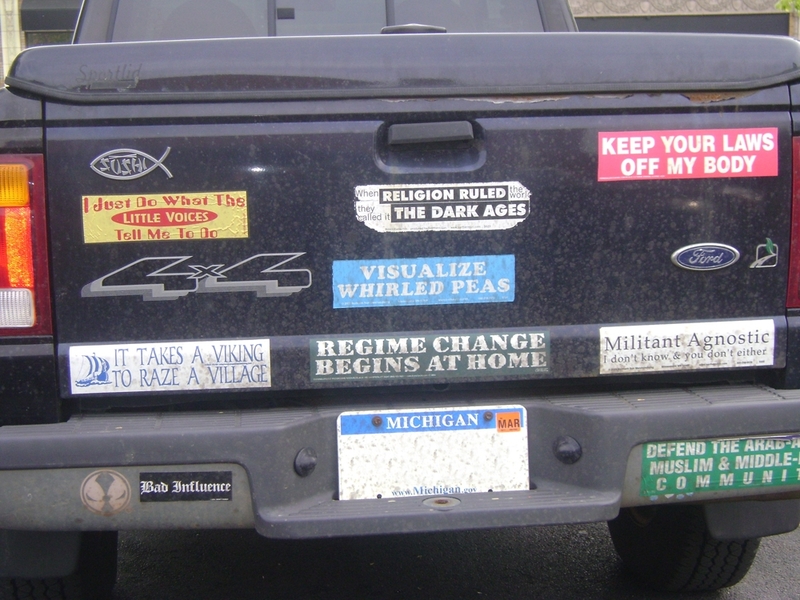 Here are a few examples; “Keep your Laws off my Body”, “Religion Ruled the Dark Ages”, “Bad Influence”, “Militant Agnostic (I don’t know & You don’t either)”,”It takes a Viking to Raze a Village”, “Visualize Whirled Peas” and in the upper left corner of the tail gate the classic Christian fish symbol with “Sushi” written inside of it. The Lord chose to have me follow her all the way into work that day so I turned off the radio and reflected on each bumper sticker at least two or three times during that twenty-five minute ride. My thoughts ranged from who in their right mind would put all those bumper stickers on their otherwise pretty nice looking Ford Ranger Pickup to, what has caused her to become so public with her opinions? I wondered what she would do and say if we had an encounter? How would I respond? I was actually wondering, does she really view Christians as “Sushi”? I have never been defined that way before and I wondered what has made this person so angry at Christians? Others throughout history have been very angry at Christians forcing believers to communicate through symbols. For many years following the ascension and the resurrection of Jesus to heaven, the Christian church grew rapidly. Those who claimed to be Christians became subjects of persecution by both the Romans and the Jews. In many locales, it became dangerous to be known as a Christian. During that time period, when two people met and thought maybe they were fellow believers, one of them would draw, on the ground, the upper half of the fish symbol. And, if the other person observing the process understood, then they would complete the symbol by drawing the other half of the fish. This was done so that they would not become “sushi” so to speak for the Romans. Today there is increased hostility towards Christians in many cultures around the world including the United States and England. I am astounded by those that believe if your fully committed to Christ and are open about your faith, that you can not possibly be intelligent. In fact some may conclude that there is something psychologically wrong with you. Others choose to think that there is a conflict between job performance and faith and therefore you can not be a professor in a prominent university or a scientist in a leading edge research hospital or hold a key role in government. People have actually lost their jobs in these career areas because of their strong faith in Christ. Christians often are mocked and disregarded by comedians and the media. Recently while in England I was watching the news and it seemed that daily there was a feature on the news that attempted to diminish, discredit and disregard christians and christianity. In the US we see this regularly with certain Hollywood celebrities and TV personalities. Even certain news stations carry this attitude towards Christians. Underneath you have a clear sense that the culture is unconvinced about christians. This is fascinating to me because our country was founded on the Christian faith. Our constitution and governing guidelines are based on the values of Christianity. Christians have historically held the most influential roles in forming and protecting the structure of our nation. I can remember as recent as the 1960s that it was still considered acceptable to be a strong christian in the careers mentioned above. And someone running around in a pickup with bumper stickers like the one I observed would be the one questioned rather than christians. The values that christians lived out would be considered a positive thing in the work place. All of this leads us to questions of, how has this animosity or scepticism about christians developed? What has happened? What are the factors that have contributed to the increased mockery and disregard of christianity? Some may quickly identify the liberal media and Hollywood as the primary cause. Others would point at higher academia and agnostic philosophers that have influenced the minds of our decision makers and future generations. And finally others would boldly declare we are in a spiritual battle and the devil is the cause of this problem. While each of these areas, and this is not an exhaustive list, have contributed to the problem, we must not totally absolve ourselves as professing Christians from the cause. In fact we may have contributed to the cause in a much greater way than any of us would like to admit. I go back to this young woman driving this pickup truck peppered with opinion. How has she been treated by christians? How should we respond to her as a christian? Would it make a difference? I know our only responsibility is to be Jesus to others. We can not change the behavior of others but we can change our own. We must not point our fingers at others. The change most needed is in us. The more we become genuinely like Christ, the more hope I have for changing the world. Our commentary is our lives. Let our living truly be one that pleases the Lord first, then impact the world around us as He chooses. I don’t know the history of this young woman but I can imagine If more christians like what I have just described would have been a part of her life, I would be looking at a Cross on that tailgate.